When I saw Becky do this, I knew I had to participate in it too. 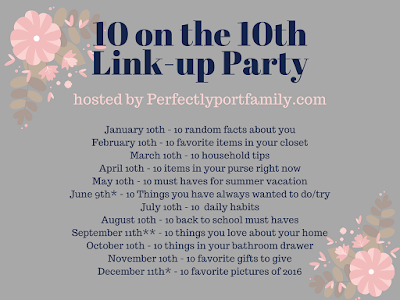 Each month there is a topic to discuss and it's numbered, there is nothing better then that. Seriously, here are the topics for the rest of the year. Thanks Erin for hosting. Before we even bought our house, I told Mr. if we buy this house, I'm getting a new stair case. Of course he obliged and I just LOVE the look of it. This is where we started, it came a long way. Here are the details on our stairs if you want to see the process. Is it okay to like the stairs twice? Haha, just kidding sort of, but I just love Christmas time and the Christmas tree that we put near our stairs. I can't wait to start decorating! Confession: We might have to start decorating early because we're going to be gone the weekend before Thanksgiving, and Mr. is going to be gone the two weeks after Thanksgiving, so we might be decorating for Christmas middle of November, I'm sort of excited. Okay moving away from the stairs, haha. I am going to go with our bathroom. Surprisingly...when I said that I wanted new stairs, Mr. said he wanted a big TV and a Claw Foot Tub. Our bathroom is stupidly big but that clawfoot looks amazing in it. Now we just need to get rid of the dollar tree drapes we bought so we could take a bath and I would be one happy Mama. Apparently I don't have a great picture of our bathtub...oops, well you get the picture. 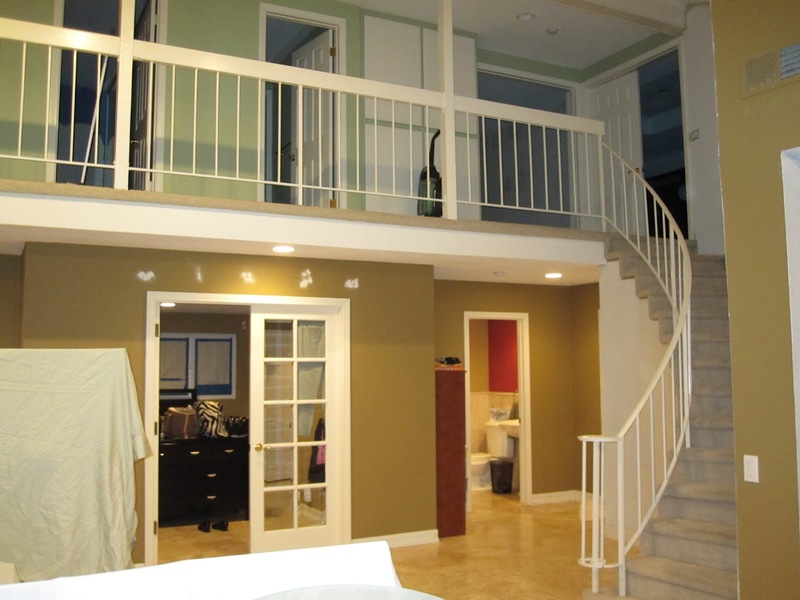 Here is the post on our bathroom renovation. We did a mini remodel on our kitchen end of last year, and I love it. I'm actually doing a post on our remodel next week, so stay tuned for that! Even though we didn't do much, I just love having functioning doors and drawers...such a treat after 7 years, haha! 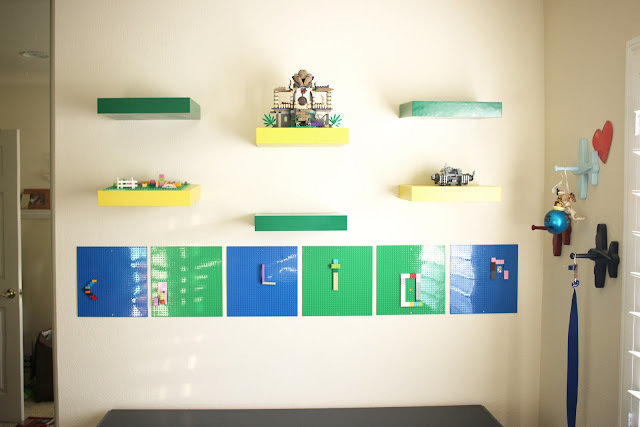 Last year Mr. make Baby Fox his own Lego Wall, I think it turned out pretty awesome, and every time I walk into his room, I just smile because so much love and effort went into it by Mr.
Mr.'s office area. He wanted the claw foot tub and a big TV. We got it, and it's a great room to retreat to after the kids go to bed. The kids are allowed to watch TV in there on a limited basis, so it really is our little piece of the house that is unjaded by kid stuff. Our closet, we ripped out everything and Mr. put in all hanging rods for me, and just recently we put in some shelves, which I have yet to take a picture of. Oops. Our backyard, we did a HUGE renovation a couple of years ago and are so glad that we decided to do it then instead of waiting a bit. We use it ALL the time. Granted I hate going swimming, actually I like swimming when it is 100° with 90% humidity, anything less then that, I am happy to watch. Our family room mantel, I love how big it is, and how I can pretty much put anything on it and so much of it, although storing all that stuff is starting to become a problem, I think it's so much fun! We have the perfect house for party throwing. We have limited room in our living room, which is perfect for party throwing. We love hosting parties for our friends and family. Especially kids parties, I love making these back drops for this huge wall that we have. I might be a little late to the party, but better late than never right? What is the favorite part of your house?